Nespresso machine - too big power draw? I've got a Nespresso machine (C-100) which I absolutely LOVE. I've been trying to figure out how big of a portable inverter to get in order to power it in the truck during travels (the coffee is that good imho). I'm not sure what kind of inverter to get... wishing I knew an electrician. I'm not an electrician by any stretch, but is 10amps for a coffee maker a large draw? Would it be a better idea to get an inverter installed in the A/S and simply pop into the trailer during stops to whip up a cappuccino? The short answer is, it is not practical . I would not even use it in the Airstream unless you have shore power. There are some things that don't add up. Watts = volts x Amps. Your specs say 220 to 240 volts. (do you use that where you live?) 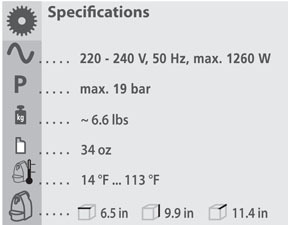 At 10 amps that would be 2200-2400 watts. The specs say 1260 watts. I am guessing that the company gave you the amperage for a 115 volt model. That would make sense. In any case whatever the power draw is. You need an inverter that can provide that power continuously. If the 1260 watts is the correct power draw, You should get an inverter capable of at least 1500 watts continuously. 1260 watts at 12 volts is 105 amps, not even factoring loss in the inverter ( and there will be some). The only way you are going to get that much current is with very big cables directly to the batteries. 105 amps is higher that the output of most automotive alternators. Therefore you would be discharging the batteries even at freeway speeds. I suggest you get accustom to lesser quality coffee, or do as I did and quit drinking it. I feel 200% better since I did. Guess I'll have to settle for McDonalds coffee, or Red Bulls to keep awake during long drives. I was spoiled when I drove around in a friend's rather large moho. We were making espressos and cappuccinos left, right and centre while on the road (thank goodness there was a bathroom ). .... or do as I did and quit drinking it. I feel 200% better since I did. Running any powerful resistance appliance (toaster, hairdryer, coffeepot) through an inverter seems like a huge draw. Don't know if your alternator could put out that wattage but warrants checking. I'll bet cigarette lighters have a maximum rating too but don't know what that is. I've got a cheapo inverter a bit smaller than a brick for my truck -- it's rated at 100 watts. Anybody else want to ask where Macfrodge found a hands free Nespresso machine? My bad. I keep ice in a thermos and make up several espresso shots in the morning for my long drive iced Americanos. I don't know anything about this company (or espresso for that matter) but here is one that can be run on propane. Maybe some one will come along and shoot my logic full of holes. That has happened before. Sometimes I feel that I don't mesh well in modern western culture. When I have trouble staying awake on long drives, I make the drive shorter. Someone once asked Ghandi what he thought of western culture. His answer was, "I think it would be a very good idea." I think I may take it up a notch, and turn the Nespresso into an internet-enabled coffeemaker. So while I'm on the road I can send a signal to the machine back in the A/S, and it'll fire up by itself, ready to go when I stop for gas. 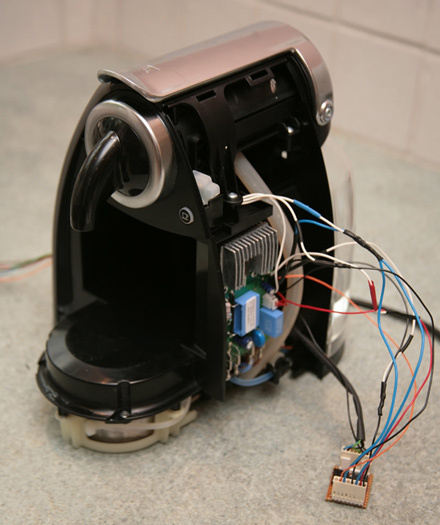 Some guys have actually done this - unclear as to how useful it would actually be (if you're in Texas and your coffee machine is in Michigan, that'd be a crappy, burnt cup of coffee by the time you'd get to it). Have a neighbor go over to your house, put the coffee on a scanner, and attach the scan to an email and send it to you. It should still be hot if done quickly enough. Hi MacFrodge, I'm new to this forum have not even introduced myself on the forum but I saw your post and had to let you know this. 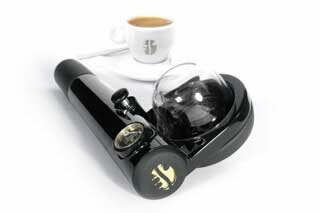 My wife gave me a Handpresso machine last year... You need hot water and this pump makes really good espresso if you use good pods. I tow where I'm told. You could install a 450 amp Leece-Neville Alternator to run that machine through an inverter. We use these on our fire trucks to run all of the emergency lights and sirens. Only down to this is the price close to $4,000.00. It would have to be real good fufi coffee for that upgrade. Have you thought about using a stove-top machine when you are roughing it? yes it can be done and it works great. i added a 3000watt pure sine inverter and can run my nespresso, frother, microwave, toaster... off of my 2-12 volt batteries. the nespresso is picky and only a pure sine inverter worked. see theinverterstore.com don't be that guy with the generator, and enjoy a good cup of coffee at a rest stop! I see you live in the Nation's Capital. Having just visited there 2009 I remember that there was a Tim Horton's just about every block in the city, and at every entrance and exit in every town in the province, including up north. Usually lots of parking too. I would think the coffee stop/washroom/freshair/kids exersize, would be more practical than investing in more batteries, inverter etc. for something you can purchase almost anywhere/anytime. How to heck do you sleep after drinking that stuff anyway???? Now, on the other hand, if you just have enough power to run the cooler, hubby will be happy with the cold beer, and life will be good, right?